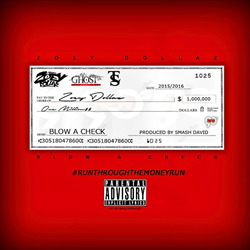 Miami Recording Artist Zoey Dollaz Releases New Single "Blow A Check"
Coast 2 Coast Mixtapes announces the release of a new single by Zoey Dollaz currently seeking blog placements and interviews. Today Coast 2 Coast Mixtapes announce the release of “Blow A Check”, the latest single by Miami Hip-Hop artist Zoey Dollaz . The single is currently available for streaming and download at the Coast 2 Coast Mixtapes website. Zoey Dollaz is currently seeking press opportunities, interviews, features, and more. He can be reached through his official Twitter page. About Zoey Dollaz: Elvis Millord, artistically known as Zoey Dollaz, was born in Miami on October 12, 1990. He grew up with one sister and with his mom playing the role of both mother and father, he learned to appreciate the little things in life. At first, he dreamed with becoming a pilot, until his mom, who was doing music as part of a church program, introduced Zoey to the music world. As a young boy, he listened to artists like Jay Z, T.I., Lloyd Banks, but his favorite music has always been R & B. Zoey began composing songs at age 12. While in high school, Zoey and his friends started performing in the hallway with a boom box as their sound equipment. They battled amongst each other and had fun with music, which became their culture. Obviously, turning a boom box on in the middle of a high school hallway is not part of the rules, so Zoey and his friends were eventually expelled from school for continuous bad behavior. Now, with this new team, (Fly Recognize Fly) FRF Music Group, LLC., Zoey is working on his solo production: “Your Girl’s Favorite Rapper.” He is currently working with producer, Killah Beatz, alongside artists like Young Trend and Biz. More focused than ever and motivated by his fans, Zoey has finally aquired the discipline required to be successful at what he loves the most: Music. For all the latest music by Zoey Dollaz, visit his official Soundcloud page.